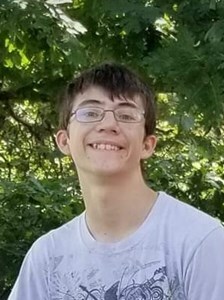 Justin Tyler Roach, 16, of Topeka, passed away Friday, November 23, 2018. He was born March 30, 2002, in San Diego, California, the son of Brian and Amber (Newton) Roach, Sr. He was an active junior at Washburn Rural High School where he was involved in Table Top Gaming Club and taught other students to juggle. He was a member of West Side Baptist Church, Topeka. Survivors include his parents, Brian Roach, Sr. and Amber Larson, Topeka; two brothers, Bradyn Roach and Brian Roach, Jr.; three sisters, Reanna Roach, Meeka Larson and Sofia Larson; his paternal grandmother, Kate Olsen, Topeka; his maternal grandfather, Mark Newton, Topeka; his paternal great-grandmother, Hazel Smith-Tindall, Edwardsville, Kansas; his maternal great-grandmother, Dorothy Newton, Topeka; and several aunts, uncles, cousins, great aunts and great uncles. He was preceded in death by his paternal grandfather, Edward Olsen; and his maternal grandmother, Sandra Newton. Justin was upbeat, caring, loved making people feel better and always had a hug to offer. The family will receive friends from 7-8 p.m., Friday, November 30, 2018 at Dove Cremations and Funerals, Southwest Chapel, 3700 SW Wanamaker Rd, Topeka. A funeral ceremony will be held at 10:30 a.m., Saturday, December 1, 2018 at West Side Baptist Church, 1008 SW 4th St, Topeka, KS 66606. Interment will follow at Memorial Park Cemetery, Topeka. The family request those attending to wear green as this was Justin’s favorite color. Memorial contributions may be made to www.gofundme.com/in-loving-memory-of-justin-roach. To leave a special message for Justin’s family, please click the Share Memories button above. Add your memories to the guest book of Justin Roach. We are so sad & will miss you. You are no longer hurting & in Jesus arms. Our prayers & love to your family. Condolences goes out to the family From RED BRUSH Panting. I didn’t know Justin personally, but I knew kids who did,and they said he was happy and never showed that they where hurting inside. I understand how hard it is to lose someone you love dearly, I too and depressed and I feel for those who are hurting inside, I wish so much that I could have meant Justin and we could have talked and maybe..just maybe.. I could have gotten him to talk about why he wants to commit suicide and we could have prevented it. And I am so so deeply sorry about your Loss and we will always have him in our prayers and we are here for you whenever you need someone to lean on. Justin was a real friend, funny, and brilliant dude. I remember one day at school, Justin wouldn't stop bothering me about Xbox stuff he wanted me to play with him on Xbox, my response was to this "why do you like annoying me?" Justin simply with a smile on his face said: "because it's fun". At the time I was not too happy that he said that, every day we walked from six-hour together talking about stuff and mostly goofing around in class. Its strange but yet something at the time was nothing ended up being the very words from him that make me happy today. I have been praying for his loved ones and will continue to pray. I just wanted you to know Justin was an awesome person and very loved by his friends. I am not gonna lie we both liked annoying the heck out of each other, it was fun. My condolences to the family, Justin was a great dude, I will never forget you, I will hold you in my heart and his family. Me and Justin were cousins but he was more than that he was my best friend he was more like a brother to me I just wanted to say rest in peace Justin. I met Justin and the other kids at the Community Center dinner program. Although Justin didn’t come as often as the other kids, he was always kind and respectful. My prayers are with all of you during this time. I will never forget your smile and your hugs. This is so hard to believe. You were an angel on earth and now in heaven. Praying for God to wrap his arms around your family. Love you justin. ????? ?